A painter paints. A writer writes. I always say this to students in my creativity class to make things simple. Sometimes it is that simple. And when it is, it’s wonderful. But sometimes one can stare at the computer screen all day and not produce a single word. It can seem like there is nothing one can say. The well from which ideas usually emerge cannot be found. Or maybe it seems like the well has dried up. That’s how I have been feeling lately. Sometimes I like reading what I write. But sometimes, I do not wish to read what I have written because it was so hard to write it. It makes me tense just reliving the process. People ask me what inspires me to write. My answer is, anything can inspire me if I am in the proper disposition. A person I meet, a sentence I hear, a dream, an affectionate memory, anger, scenery, etc. can inspire me. But when none of these appear within the vicinity of my creative field, a deadline does it every time. There is nothing romantic about writing. It is a job that must be done, the product submitted at a certain time. Those imperatives often get me started and strangely enough, I finish and submit the article or the song on time. I can compare writing to athletic training. You run and run and it feels great to be in top form. Sometimes, you run until everything hurts. But you still run. When you are lucky, you break some personal best record of sorts. And when the gods are smiling at you, you can break a world record. But what you need to do for any of these things to happen is to run whether or not you feel like it, whether or not you are inspired. You run because, well, a runner runs. Whatever or however things turn out, at the end of the day, the result is the state of the art of wherever you are at that particular point. You are always doing your best. No need to compare yourself with the numbers you had the day before. I once told a priest that I thought I was having a spiritual crisis. I told him how meaningless going to church was. I found the homilies so boring wherever I went and whoever delivered them, and how they seem to be mere repetitions of old themes I had been hearing since childhood. He looked at me and broke into a smile. He said, “Of course. Did you expect the messages to change?” I thought about his answer. Indeed! The messages are the same! The messages are simple. At certain times in my life I was inspired by them. They rang true then. Have I changed? Maybe the homilies are not the problem. Maybe it’s me. Maybe I am stuck or tired of hearing them in the same ritualistic form, or the way they are delivered. Maybe I should look beyond the words used, or the tone of the voice, or the heat inside the church and “just listen” without letting my prejudices get in the way. I was once struck by this quote: “Have you lived 10,000 days? Or have you lived the same day 10,000 times?” Wow. What a big difference these two experiences were, I thought. One was all about newness, adventure, joy, growth, awareness while the other was about being condemned to the soul-killing drudgery of repetition. In truth, there is no such thing as repetition. If your eyes are open, you will always see something new, or feel something different. The practice of self-awareness makes everything more alive, fascinating, and yes, even more blessed. That’s why sometimes, more than art, writing is a spiritual practice. It is the practice of being committed to one’s craft, to writing one’s truths. It is a commitment to one’s readers. And it is being true to one’s stated profession and doing what a writer is supposed to do. Can you imagine what would happen if a doctor refused to see his very sick patients simply because he did not feel like it? It is more important to be true to one’s being or calling than to be guided by what one is feeling at the moment. As we all know, feelings come and go. But one’s calling must unfold in the world regardless of how one may feel. Yes, a writer should have a sabbatical now and then. That is understandable. Or drop out of writing altogether. We have the right to let go of things that have stopped giving us payback — monetary, psychological or spiritual. We are allowed to outgrow certain things and move on to newer things. But while I consider myself a writer, my job is to write. Whatever you are doing that gives you joy and feeds your passion, make sure you have the power to keep it sustainable. And only with self-awareness can you do that. I had two extraordinary experiences in Palawan. One was as a tourist. The other was a mystical one. I went to Palawan with a few bloggers last week on the invitation of AirAsia Philippines and the Tourism office of Puerto Princesa to cover the Baragatan festival, a celebration with a trade fair that includes booths from every municipality in Palawan, a float parade and a beauty contest. After checking into our hotel and lunch at the iconic Ka Lui cafe, we went directly to the Capitol. Out in the streets, it seemed like the entire city was involved till early evening. It was fun to watch and join but the heat left me exhausted. We were up early the next morning to drive to Sabang which is on the other side of the island facing the West Philippine Sea where activities awaited us. After a 90-minute drive, we reached the port where we were to take a motorized boat to the famous Underground River some 20 minutes away. We were excited. We hopped on a boat that took us to the shore where after a short walk, we boarded a tour boat that brought us inside the cave. I was absolutely enthralled at the site of this majestic geological phenomenon that rightly deserves to be on the list of New 7 Wonders of Nature. It was a magical 40-minute exploration of fantastic rock formations and stalactites as we were paddled slowly inside the cavern while listening to our eager, learned and funny guide. After the cave tour, we took another boat to a zip line where we registered as visitors prior to a 10-minute uphill walk. Soon after we got there, we were all strapped in for the 800-meter zip line ride that took a minute and a half, more or less. My wife Lydia and I decided to go together. It was fabulous and fun — a great thrill amidst amazing scenery. We then took a short jeep ride to the Daluyon Mountain and Beach Resort where we stayed. It is a wonderful resort nestled between two mountains on its side and back, a beautiful white sand beach and a smooth sea floor. We were impressed by the sumptuous food that came in big servings and the charm of the entire hotel. It merits mention that the Daluyon Resort has twice been given special awards among hotels in ASEAN for its zero carbon footprint operations. It runs on solar energy and generator and goes the extra mile in being environment friendly. At lunch, heavy rain started to fall. We had to cancel a mangrove boat tour and decided to retire to our rooms for a nap. An hour after, when the rain stopped, I decided to go to the beach for a swim. In the midst of the awesome scenery which consisted of the great expanse of the ocean, the beach, the mountains and clouds, I felt a sudden change in my sensory perception which become completely intense and altered. I felt everything come alive and pulsating with my heartbeat. I looked around and I was totally involved, immersed in everything. The world was alive and new and communicating with me. It was speaking to me intimately. I was fully aware and attentive to everything. It seemed as if the entire universe had come together, at least during that moment. A thought came to me and it was this: while there are gazillions of atoms and molecules all over the universe that give shape, color and texture to everything, how is it that this particular configuration of mountain, sea, clouds, water, sand have been thrown together here where I am into a perfect unity? God is here, I told myself. I began to speak out loud expressing great awe, surprise and wonder, and not too long after, I felt I was in ecstasy, inside a full-blown epiphany. I was sure I was in the presence of God. Everything I saw and felt confirmed it. I felt humbled yet special. Was this kensho, or satori, which is the awakening of oneself that we talk about in Zen? Was this enlightenment or the so-called Oneness? I did not know what to call it and it did not matter. In the presence of God, all I could do was express repeatedly a heartfelt “Thank You.” How awesome and great it was as I felt God permeate my entire being. There was nothing in that space and time but God. Paradoxically, there was not even a “me,” even though I was part of it. God was everything and everywhere. I felt an affirmation of life, of eternity, art, love, oneness, compassion, creativity and everything that sustains my spirit. I felt my own essence and that of the universe and it went deep into my being. It seemed that everything I was seeing was magnified a thousand times. I was inside everything, and everything was I.
I got out of the water in a state of bliss. Soon after, my wife joined me and a few other people showed up at the beach. We went back to the water and swam some more. The next day, we toured the Heritage Museum and the War Museum — two small but interesting exhibits. The first featured a historical and geographical view of the island. The other was a collection of World War II memorabilia of Vice Admiral Higinio Mendoza, a war veteran who has devoted his life to keeping alive stories of Filipino valor and heroism. We ended the visit with delicious and elaborate snacks at La Terrasse, a must-visit resto in Puerto Princesa. Palawan felt like paradise to me for two reasons. It still has a lot of nature’s beauty packed into it. The air is clean. There is hardly any garbage floating on the ocean. One can still see giant lizards darting around in the bushes. It is a great place to escape city stress. The second reason is what seemed to be a mystical experience for me. We are all born in Eden, but in the course of being alive, we all eventually get thrown out. What I went through that afternoon on that deserted beach gave me a glimpse of what Eden must have been like before we were doomed to live outside its gates. Last Friday was our 117th Independence Day. In the face of a predatory China slowly gobbling up parts of our country, the past few weeks have left me with a lot to ponder on. How did this happen? Did all this have anything to do with PGMA’s decision to invite China to do joint explorations in Philippine waters? What is the right response? What will happen to our country in the event of an all-out war between the US and China? A lot of you, I am sure, have asked the same questions. While we have had many years of independence despite the American, then Japanese occupations, plus martial law, it seems we have not been proactive enough about enhancing our independence. Sure, we’ve fought for our rights and freedoms many times. We’ve just never done anything significant enough to constantly improve our military capabilities through the years. (We have actually only begun to put some serious thought into developing our military capabilities for defense against other countries during this Aquino government.) We have also been remiss in strengthening our national character to be more responsive to challenges we face as an independent nation. What good is our independence if we do not show the strength to guard, protect and enhance it? What good is it if our independence bogs us down more than it pushes us to respond to our problems? I am one of those who believe that whatever the situation, we can find solutions or take steps that can alleviate this dangerous condition. I would much rather light a candle than curse the darkness. Here are some thoughts and suggestions that, humble as they are, may help. 1. Seriously review our military preparedness and training. With political will, we can substantially improve and expand our military capability in the next five years. Let us improve training and purchase the necessary equipment to finally modernize our military, especially our navy. Only then can we be in a better position to deal with outside threats. There are also non-military steps we must consider that will make our nation and independence stronger and more functional. I am talking about ways to strengthen our national character. 3. Call on every sector of society to clean up its ranks, and, like Japan, inculcate a culture of honesty and constant improvement in efficiency, service and productivity. It is a dynamic and effective way of rebuilding our society and institutions. Surely, we can only become a stronger, more resilient nation and people. 4. An independent nation is an educated one. Let us pour more money and effort into education that gives more than just skills. I’m talking about educating Filipinos to think critically. This is crucial. This will make us more employable and will empower us to make better choices in life. It will also make us wiser about the issues that plague this nation, especially when we need to choose the leaders who will run the country. 5. Let us stop being negative. We are not the worst nation in the world, as some people might want us to believe. We are a young nation on the move, and the past few years have seen us making strides in many areas in our national life. Let us also cease blaming our colonial past. Almost every nation that was colonized has moved on and has gotten over their colonial trauma. We need to be done with this victimhood complex. We are a free people now. Let us imagine our own future and go for it. 6. Call on media to set a better agenda daily for national discussion. When influence peddlers decide that the Philippines is an awful place and broadcast this to the rest of the country, people tend to believe it. Media, whether we like it or not, dictates the national mood. The media, therefore, needs to be more intelligent, accurate, fair and holistic when they facilitate the national discussion of issues. The media must do more than inform and criticize. They must also inspire. What is happening now is far from this. What we get is an unrelenting daily stream of bad news and ranting, especially on AM radio. Sure, everyone wants media to be free; that freedom is a good thing. But the truth is, a big chunk of media is far from being free, not because it is censored by government, but because powerful people have bought it and rule over it. Media wants self-regulation but can hardly regulate itself. I really don’t know if media is capable of doing its own policing. It does not even report on the corruption within its own ranks. It is simply quiet about it. At the end of the day, if the national mood is that of hopelessness and helplessness, I’d say that media plays a big role in it. Benedict Anderson, a writer who was largely influenced by Jose Rizal when he wrote Imagined Communities, says that “a nation is an imagined community.” The collective imagination of a people influences its actions and shapes their nation/community into what it is. If we do not like what we are experiencing as a people, then let’s collectively reimagine what we want and act in ways that can change things. I do not say this lightly. I mean it. If we imagine that we are truly independent and free, and we all commit daily to making the ground we stand on a better place for everyone, it will be so. Like a truly free and independent people, let’s reimagine ourselves and the Philippines in a much bigger, bolder way. The buildup to it was just right. 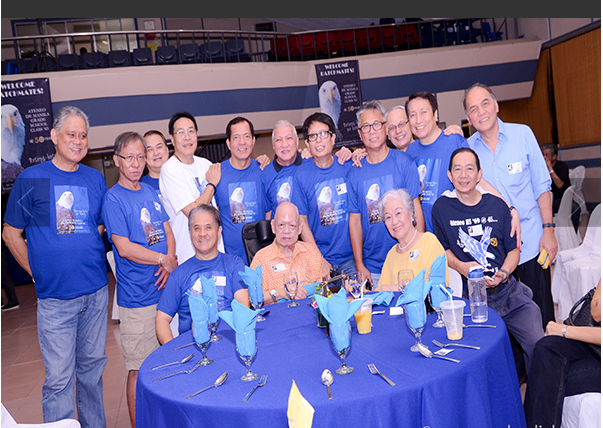 We, members of the committee, met five times before May 31, 2015 which was the 50th anniversary of our class graduation from the Ateneo De Manila Grade school. We were in charge of planning how to celebrate the important day which included fundraising, choosing the venue, the food and preparing the program for the evening. It was amazing how things materialized from mere wishing and imagination. The funds, giveaways, prizes were contributed by classmates. We chose and approved a good caterer after a free meal-tasting lunch. The Ateneo Grade School office made everything easy for us regarding the venue. It was therefore easy for the team organizing everything to deliver more than what was expected. We always felt good saying it then, and even now as senior citizens. It is a prayer etched upon every Atenean’s heart that started his education in this campus in Loyola Heights. The next event was a tour around the grade school campus. Many things had changed in 50 years. There were more classrooms and sections now. The location of the library had been transferred. There were more areas for formal sports. But the layout was still recognizable enough. The flagpole, rock garden and canteen were still in the same locations. I remember enjoying the campus as a very young man. But here we were, 50 years later, walking its corridors once again. It was like a mini time machine: touring the grounds and passing by our old classrooms from Grade 1 to Grade 7 brought back many memories. It’s amazing how, not too long ago, we would buy yo-yos, trumpo, petugo, tarat, texts and so many other goods from vendors selling them through a wired fence near the pergola. It was a real childhood, without all the electronic gadgetry that makes young people today quite sedentary compared to us then. I wondered at how much we could run and play then in the many open spaces under the sun without suffering heat stroke. My classmates laughed when I pointed out how the sins we used to confess every month had gradually changed from Grade 3 to Grade 5 as hormones kicked in. We then heard Mass at the chapel of our youth officiated by Fr. Frankie Mabanta, another classmate. This was the chapel where we received our first communion and where we spent many hours attending Mass, praying, listening to religious talks, etc. The carved ascending angels at the altar still entertained me for the same reason then as I gazed at the top two angels resting their heads on the wooden beam. Did they bump their heads? I chuckled at the distraction. We then proceeded to the dining tables where old classmates joked, laughed, and caught up with one another’s lives. It was mind-boggling to realize that we were all senior citizens now, looking back 50 years, yet how, in many ways, we were still all the same. The old nicknames endured. It was memorable and delightful to see Mrs. Valentina A. Bonifacio, and Mr. Mariano R. Singson, two of our former teachers, still present. It was even more heartwarming that they remembered each and every one of us. We watched the videos our classmate Aris Africa put together to honor our class, the education and formation we went through, our former teachers, and our dear departed classmates. There was a feeling of nostalgia, fondness and appreciation, but also shock at how many in our class had already passed away. Fr. Arevalo SJ, who gave the commencement speech when we graduated 50 years ago, was our esteemed speaker for the evening. He asked us to pray that more young people enter the Jesuits to continue the proud tradition of Jesuit education everywhere. Recognition trophies were given to classmates who had made substantial contributions in the fields of health, spiritual care, entertainment, communication and social work. To contribute to our class fund, I auctioned some photo pieces I had exhibited in the past. I felt good that my classmates appreciated them and bought them all. Band music led by our class doctor and weekend rocker Eddie Boy Rodriguez and his wife followed until the wee hours. The magic of living long enough to be able to glance back at one’s early years is a gift. This 50th reunion was such. It made us feel thankful for the fortune of being born in our designated time and place and circumstances. I am not sure if I can say it was fate. Maybe it is sheer stroke of luck that we were all thrown into this class together. We will never know. Maybe the point is not to know but to live in surprise, delight, appreciation and gratitude for how things have turned out for us so far. And hopefully, there will be more happy gatherings and reunions ahead as we move closer to our last quarter of our lives into forever.